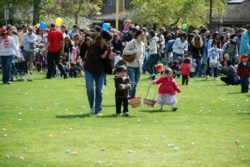 Each year the Bunny visits the Burgess Park with toys and candy filled eggs for girls and boys ages 8 and under. The Burgess Egg Hunt festivities start with bounce houses, crafts, and pictures with the Bunny. Be sure not to miss photos opportunities with the fire trucks and maybe take a ride on “Old Tom”, an antique fire engine. Activities are co-sponsored by the Menlo Park Firefighters Association and Menlo Park Fire District.